I’m so excited about my latest pattern. I have designed a row by row quilt for beginners to teach techniques, which is still in progress. But I just thought the starfish are adorable and would make such a cute baby quilt. …And it did. In fact, I’m so taken with the starfish, I had to make bunting to go with it. 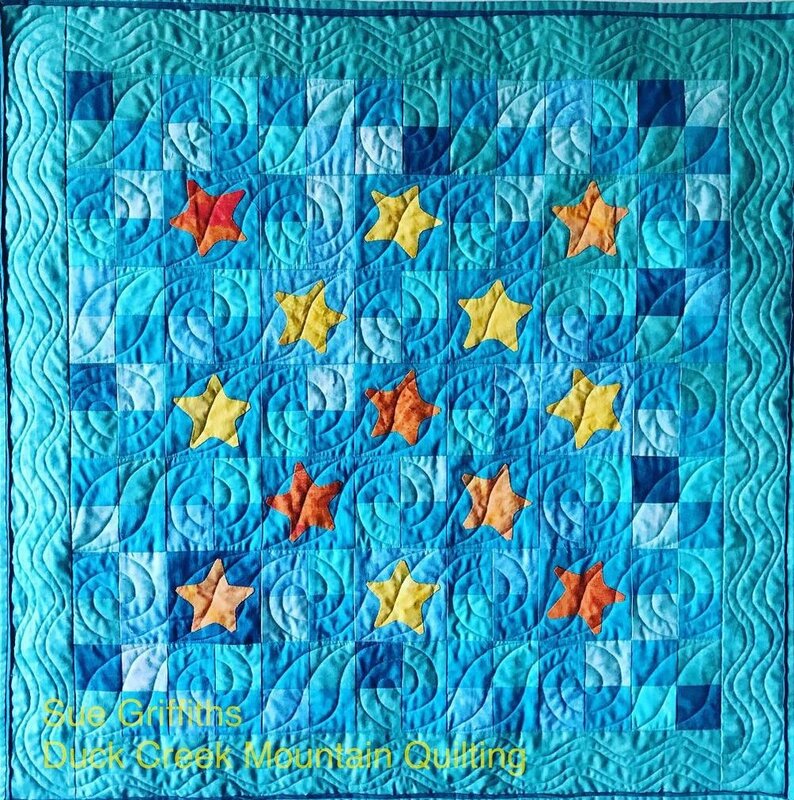 The piecing is essentially straightforward, the squares are joined into fourpatches so they are the same size as the starfish and then the normal pickup rules apply. 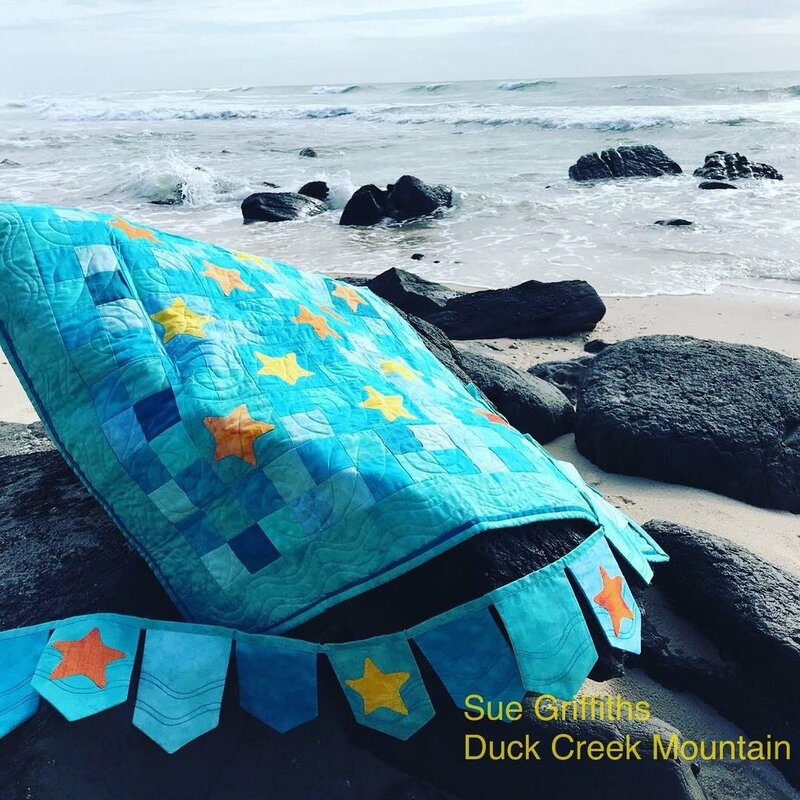 The starfish are made with mock hand applique which gives a nearly invisible stitching line, is very strong and washable, and is my favourite applique method. I’ve put some skill sheets in the pattern for those who haven’t done this method of applique before. The border is a simple wave pattern which turned the corners just fine. I pounced the pattern on and that was where I had a caniption because I hadn’t properly unthreaded my machine before creating the pouncing template. (Note to self: don’t be lazy, unthread your machine). I then decided it really needed bunting. I sewed the wave pattern that is in the border of the quilt onto the bunting with bobbin work. (ie, I sewed from the back with the thick thread in the bobbin). This looks like couching and is very easy to do. 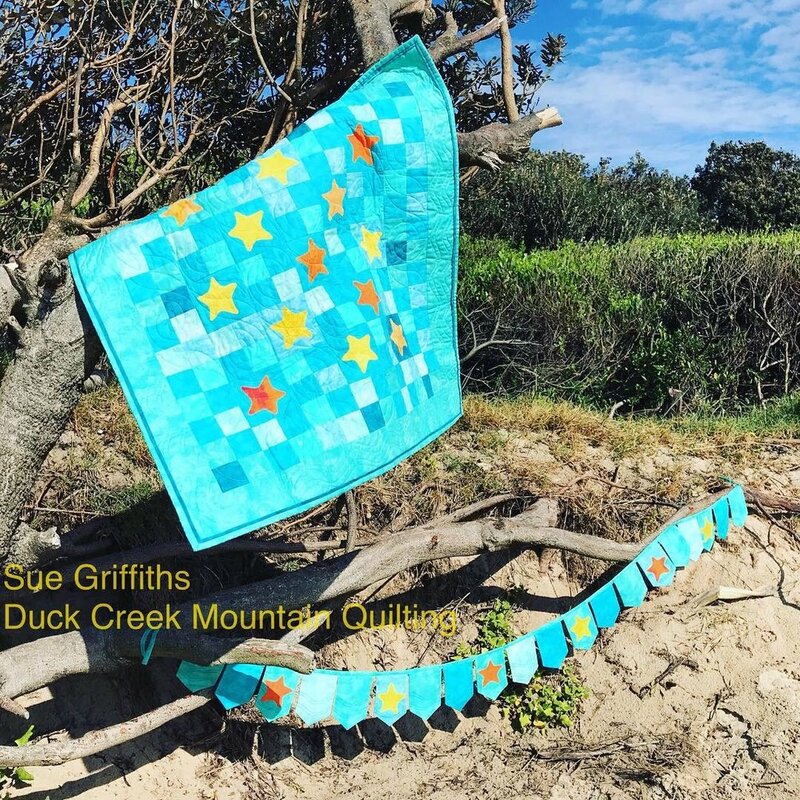 Then I sewed the starfish on, backed them all in a variety of yellows, blues and greens so the bunting is cute on both sides, and sewed on a binding. I made the binding along the straight of grain. I still think it is adorable. One of my work colleagues is having twins …. I had decided to buy her a present rather than give her a quilt, but I had a talk to her. She’s done the nursery in white and grey with the intention of adding colour when she knows whether they are boys or girls. She told me she and her husband are all about the sea …. What do you reckon? Do I have to give it to her because she’d love it? Do I have time to make another?